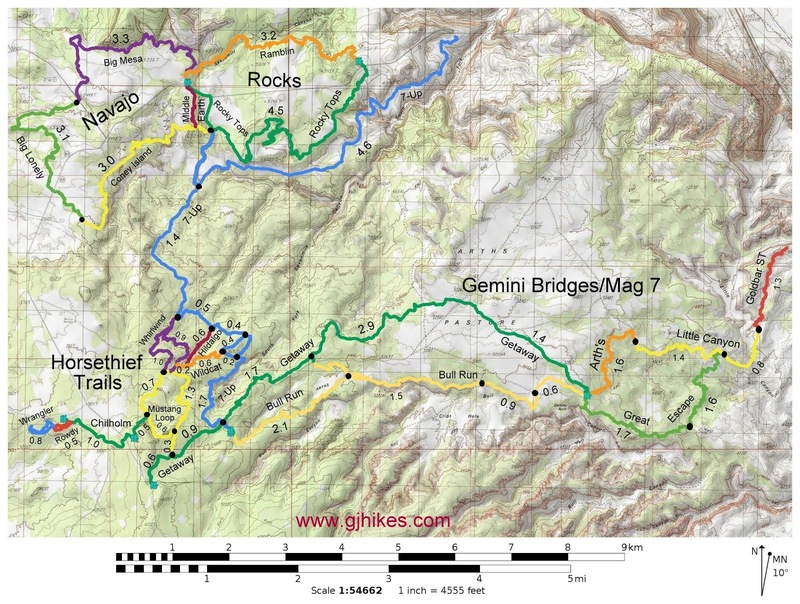 Arth's Corner is located in the Gemini Bridges Trails Area near Moab, Utah and is the 2nd leg of the Magnificent 7 trails. The trail begins at the junction of the Getaway, Bull Run, Great Escape and Arth's Corner trails where it parallels the Gemini Bridges Road for about a mile before heading over to a junction with the Metal Masher Road.The Little Canyon trail can be picked up a short distance down the Metal Masher Road where it intersects with the Gemini Bridges Road..
To get to the Arth's Corner trailhead drive 9 miles north of Moab on Highway 191, turn left onto Highway 313, and continue for about 13 miles to the Gemini Bridges Road. 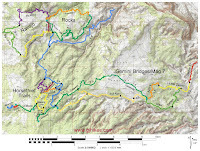 Follow the Gemini Bridge Road for 5.5 miles to the trailhead. Under good conditions the trailhead is accessible by 2-wheel drive vehicles. Vehicles with very low clearance might want to park at the Gemini Bridges trailhead which is probably not more than a quarter mile away. The trail starts out gaining about 20 feet of elevation as it climbs up from the trailhead to the edge of the mesa that is known as Arth's Pasture. The trail base is the usual fare of slickrock intermingled with patches of red dirt. After the trail gains its initial 20 feet or so of elevation near the trailhead the rest of the route continues on a gradual downhill 5% grade. All of the uphill sections added together come out to 121 feet. A good guess would be that the trail is at least 80% slickrock that ranges from smooth to bumpy to broken. Near the 1.5 mile point the trail makes a small drop down to the Metal Masher Road. Following the road to the right about a tenth of a mile leads to the beginning of the Little Canyon trail. The Arth's Corner trail would probably fall into the 'Beginner' category as far as the technical skill level goes if it weren't for a couple of minor ledges and transition points. The elevation grade is low enough that even in the uphill direction it isn't that much more difficult. While Arth's is the 2nd leg of the Magnificent 7 it is probably more commonly used to create a loop with the Little Canyon and Great Escape trails. If you would like to see it for yourself then all you have to do is grab your bike or 'Take a hike'.